A recent article in The Age explored the top ten superfoods. Over the next couple of weeks I’m examining each of the claims and adding a few of my own. Which ones will live up to the hype? The claim: “high in Omega 3 fatty acids”. The evidence: According to Nutrition Data chia seeds do have more Omega 3’s than comparable foods such as flaxseeds (linseeds). Though flaxseeds have a much wider and higher mineral content, suggesting it’s overall nutrition may be more versatile. 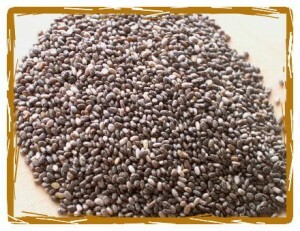 Value for money: Chia seeds are on average 3-5 times the price of flaxseeds. Verdict: If you love the taste of chia seeds, then go for it. If you’re eating them for the perceived health benefits, consider flaxseeds (or organic flaxseed meal) instead. They still offer a reasonable amount of beneficial fatty acids but a lot more calcium, magnesium and other wonderful minerals for a fraction of the price. Caveat: Co-nutrients such as zinc and vitamin E and B6 are needed for the body to utilize Omega 3’s from plant sources. Pretty much all unrefined seeds and nuts have a range of beneficial fats, vitamins and minerals. Most of us could do with adding more of them to our diet.